Josephus tells us that John was 'sent a prisoner, out of Herod's suspicious temper, to Macherus, . . . and was there put to death'. 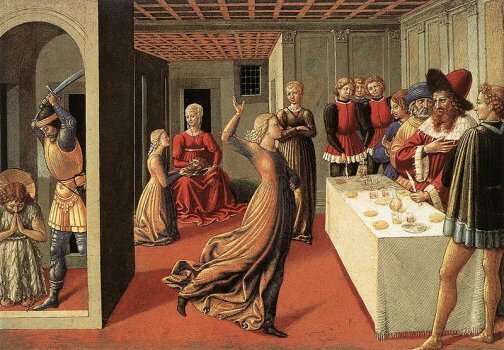 Mark's account of the death of John is the only source for the tale of the dance of Herod's wife's daughter at the feast. The delighted Herod offers her anything she would like: 'Whatsoever thou shalt ask of me, I will give it thee, unto the half of my kingdom.' (Mark 6 v23) Her mother, Herodias, sought revenge on John because he voiced disapproval of her marriage to Herod, as she had previously been married to his brother. 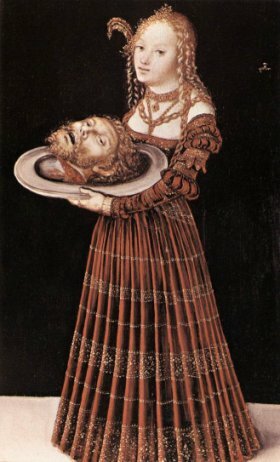 She persuades the girl to demand the head of John the Baptist. As a narrative it is rather unconvincing, and it contains historical errors and confusions in translation. Some versions tell us that the dancing girl is Herod's daughter, some say she is the daughter of Herodias, so presumably his step daughter. Some versions name the girl as Herodias. Josephus states that Herod had a daughter Salome, and this is the name that has stuck. That John was executed by Herod is almost certainly historically accurate, but this tale is probably myth. Josephus's brief account is more likely. 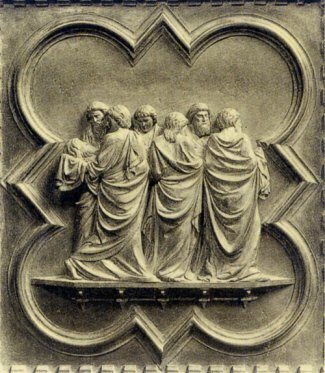 However, that hasn't prevented artists (and opera composers) making the most of the story, and it is rather startling to consider that the Dance of the Seven Veils has a biblical origin. 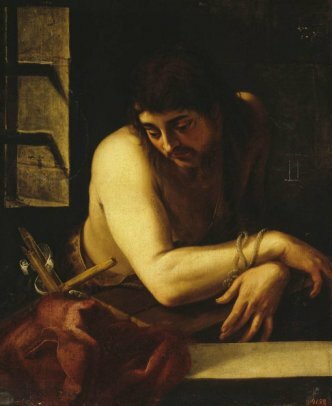 John the Baptist in Prison: Juan Fernández de Navarette. 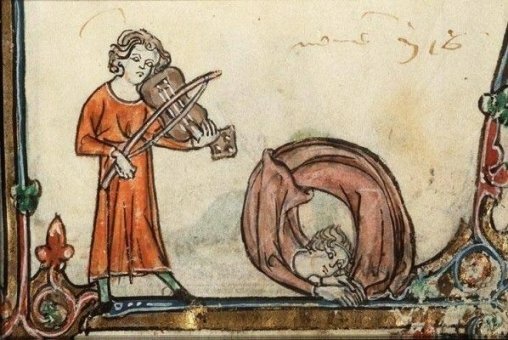 The illustration from the 14th Century manuscript on the right below shows a very acrobatic Salome; no wonder Herod was impressed! 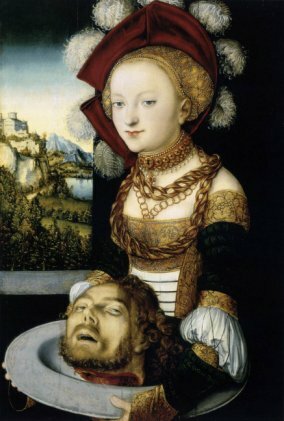 This is a familiar image painted by many artists, but, self-indulgently, I am focusing on two more paintings by Lucas Cranach. At first glance, the face of Salome is the picture of innocence, but look again, especially at that half-smile in the second picture! 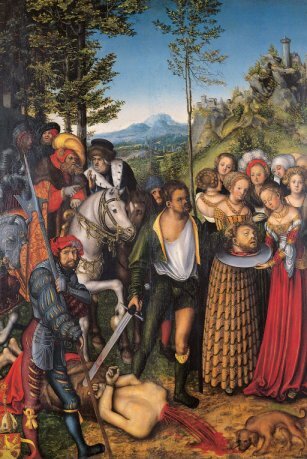 Matthew 14 v 12 tells us that John's supporters collected the body and buried it; to judge by Pisano's image, the head was reattached, so perhaps Salome had decided not to keep it as a memento. According to legend, the body was buried in the Palestinian town of Sebastia, near Nablus, where a shrine remains in what is now the mosque. The historian Rufinus records that the bones were dug up and burnt c362. The story of the Baptist's relics has got somewhat out of hand: his right hand (the one that baptised Christ) is in at least three different places, and his head is said to be, or have been, in places as far apart as Rome, and Halifax (holy face) in Yorkshire. 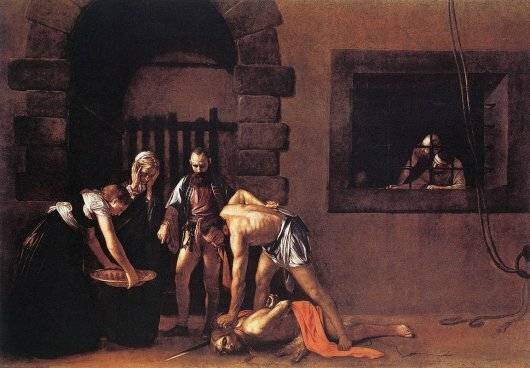 Andrea Pisano: The Burial of John the Baptist. 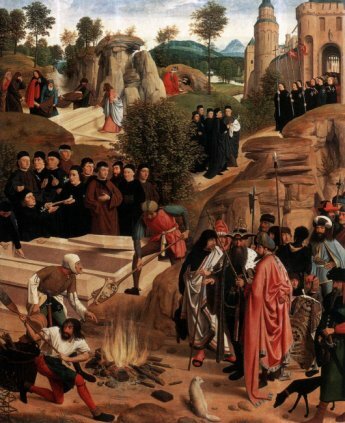 Geertgen tot Sint Jans: Burning the Bones of John the Baptist.